After our afternoon walk near the Trocadero, we went to the Bon Marché for some more “window-licking” before heading back to our hotel nearby for a siesta before dinner. We wanted to go to another of Christian Constant’s restaurants on Rue Saint Dominique, the newest one – Les Cocottes, where Nicolas Sarkozy is rumored to have had lunch recently, but we woke up late from our nap and decided to eat down the road instead. A block away from the hotel on the rue du cherche-midi is an unassuming place with red awnings and a few outdoor tables favoured by locals and residents of the 6th arrondissement, La Marlotte. We walked in without a reservation and were seated in a corner table near the entrance. Surprisingly, the server recognized us as she had seen us walking by in the morning and asked us about our day. There were a few diners in the front room but soon after the place was half-full which is not bad for a Monday evening. Menus were given to us along with some crisp and chewy sourdough bread from Jean-Luc Poujauran. There were also a few specials listed on the board including a creamy soup of white asparagus and a steak Tartare. 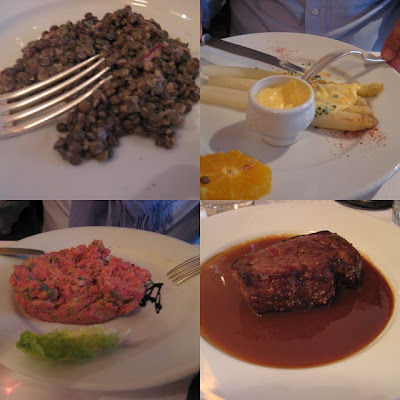 I chose for the saladier de lentilles vertes aux échalotes (a simple salad of green lentils with shallots) to start while my husband had the asperges blanches servies tièdes, sauce Maltaise (warm white asparagus with sauce Maltaise). For our main courses, we both decided on meat since we already had fish for lunch. Sadly, since raw food isn’t a good idea when pregnant, I couldn’t have the Tartare so I had the pavé de rumsteak au poivre (rump steak with pepper) instead and he had the steak tartare accompanied by a glass of red Bordeaux. Our starters were served soon after – my lentil salad was especially good because of the tangy wine vinegar dressing while A‘s asparagus were perfectly offset by the sauce Maltaise – a lemon zest and blood-orange juice flavoured Hollandaise sauce. Main courses came quickly, both served with a paper coneful of hot, crispy thick-cut frites. His tartare looked delectable (although I didn’t get to taste it) while my rump steak was a point just as I asked and crusted with roughly ground black peppercorns. Since I really enjoy spicy food, I asked for some of the nasal-clearing French Dijon mustard that one can only find in France to accompany my steak. We finished our main courses and skipped the cheese since I couldn’t have any unpasteurized cheese and did dessert instead. At first, we were going to share one dessert but when we saw the choices we couldn’t agree on which one to have – my husband was craving for the profiterole au chocolat Valrhona while I was dead-set on having the ile flottante de la Marlotte so in the end, we had both. I know, I know – too much food, but when in Paris, we throw diet restrictions and caution to the wind and just eat what we love. Good thing we did because the profiterole (one large one instead of the usual three small choux pastry bites) was decadently rich with the bittersweet Valrhona chocolate sauce and the ile flottante was a light fluffy egg white mound floating in a sea of vanilla-flavoured crème anglaise and caramel. Espressos ended our simple but delicious meal and to avoid going straight to bed after all that food, we took the long route around the block and walked slowly back to the hotel. Since the last time, ownership of La Marlotte has changed but the place is still good with bistro classics and still have bread from Poujaran and a cheese selection from Quatrehomme. Also, their ile-flottante hasnt changed over the years which is good news. Good value for lunch and now being frequented by a younger crowd than before although dinnertime is still for the older residents of the area.